How are you all? It’s been quite a week since last week’s weekly post. The kids have had a few days off school on holiday. We don’t have half term as such here, we have two days and an inset day. Last weekend saw Tyler at a football birthday party which he enjoyed and Lucas went shopping for football boots. Aria and I had some fun building some Gravitraxs and jigsaws. My migraines were a bit all over the place at the weekend as was I in terms of mental health with the changing of my tablets and increased doses. I wasn’t able to do much myself. Lots of talking and tears, things got better. Sunday, saw a day indoors we had no football or gymnastics due to the school holiday on Monday. So, we played and in the evening I went out for dinner with a friend. It was nice to catch up and hear how she and her family are doing. Monday, the kids went over to Robert’s parents to spend the day with their twin cousins. They went to a trampoline park and out for dinner. They had the best time while we were at work. New staff at work has made for an intense week, so that’s been a tiring one and I’m glad it’s the weekend. What is it with cats and boxes? I found Twilight crammed into this tiny table tennis box. She’s a small cat, but how she could fit in there was beyond me. Crazy isn’t it? Cute though. Tell me it’s not just my cat who loves boxes? I had the day off on Tuesday to do something fun with the kids. We built some Gravitrax together, ate some lunch before heading out to do some ten pin bowling. All three kids love ten pin bowling. We went to Cosmic Bowl which is dark, with lots of bright, cosmic, fluorescent colours. Not the easiest place to take pictures, but I captured one of Aria and her pink bowling ball. Pink is her favourite colour, she loved it and wanted to take it home. Lucas won the competition, but all three kids had the best time. It was the first Lucas won as his Dad usually wins, yes, he’s most competitive. A few shots of the machines, you know, the flashing lights are like some kind of hypnotic beam for kids. We finished off our day out with a slushy. Lucas went to table tennis in the evening. His first time there and Aria and I stayed since there was no school the next day. Aria is desperate to play, but still a little young. Lucas enjoyed it and hopefully, it’ll be a new thing for him. When we got home there was some maths homework that took a fair bit longer than we thought. A long night later and we all got to bed. My Mum had the kids Wednesday and a long, so long working day for me. Lots of crafts are always what the kids love to do with my Mum and Lucas went out with a friend for a bit. I came home to some happy kids with lots of crafts to show me. Football training for both boys in the evening and Aria and I read lots of bedtime books. Thursday, was back to school and work for us all. It was also Valentine’s Day. Aria had some fun blowing kisses with her new toy which was cute. I got a lovely card and some roses, who says romance is dead. A couple of chicken kebabs for us adults after football training for both boys and that was the end of our Valentine’s day. Every sunrise is a chance to brighten someone’s day and that sunrise above certainly brightened my Friday morning. There is a very short window to spot and capture, I am grateful I did before the school run. Lots of football matches on the cards this weekend. I am hoping for some dry weather and hoping to fit in some more of my re-write for my novel. I’ve not done much this week. The kids have required a fair amount of attention this week, which is par for the course of being a parent. My mood has been in the right place for the rest of the time. But, here’s hoping I can get back into it. How has your week been? Do you have half term? Any nice plans for the weekend? 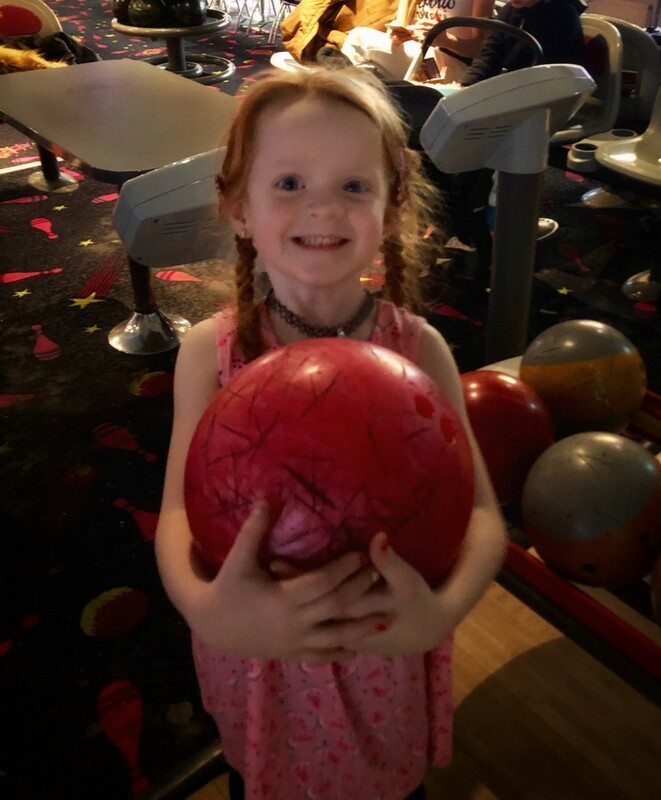 Hi Susan, it must be difficult juggling half term when you are working, but at least you have your Mum at hand, which must be a godsend… Cosmic bowl sounds like fun and Aria is a girl after my own heart. I would take anyone down for a pink bowling ball… I agree that seeing sunrise can brighten the rest of the day… We’ve had a nice balance of a weekend. We are going on our regular Sunday hike with the group in a bit. We did one with friends yesterday s my legs are a little tired, but at least I can justify the cake I plan to enjoy later. I hope your migraines and health settle a bit soon with the changed doses of your medication. It sounds like the kids had a lovely few days off school. I love the photo of Aria with the bowling ball. Bowling in our house is usually won by my husband and sometimes by my younger son. The rest of us are pretty terrible at it! Susan the migraines sound awful – hope they sort the medication out for you soon. Lots going on this week for you. Hope the kids enjoyed the break. Ahh! We are just starting half term here. We are ready for a break. Sending hugs. You are really going through it with the migraines. Fab photos! It looks like you have had lots of fun. Yes, cats and boxes go together. 🙂 Your cat has such an intense gaze in that first photo. 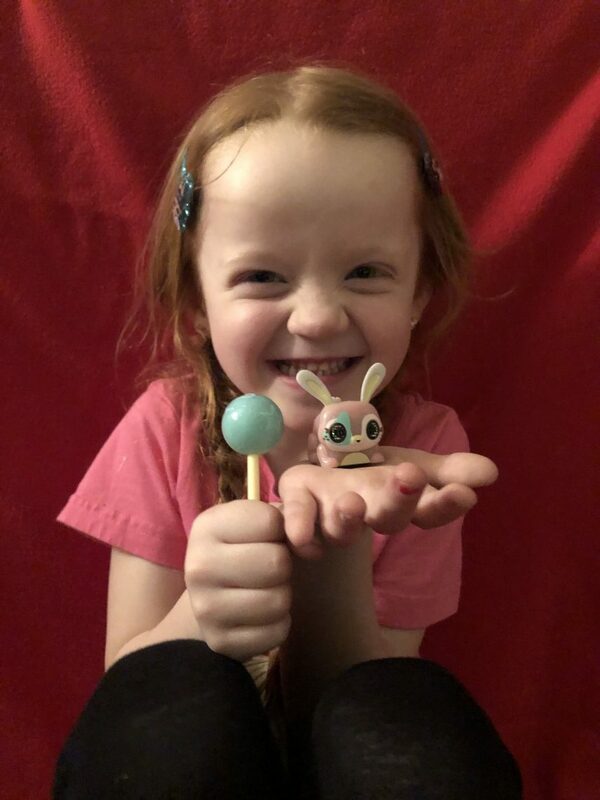 Aria looks so pleased with her little bunny toy, she is a cutie. The sunset is beautiful. Hope your migraine can be treated with new meds. sounds like a good holiday balance with one day for you and one for each of the grandparents. they seem to have enjoyed the different days that they had. I quite like bowling but we don’t go very often sadly. One happy looking Aria ( as usual). Sorry to read you are still not getting any major relief from your migraines and you are struggling with life in general……sending hugs…..
Definitely not just your cat….mine loves boxes too..and she will sit on any pieces of paper that might be on the floor or on the youngest’s book bag! My brother could never read the newspaper at the table as the cat would come in and sit on it! 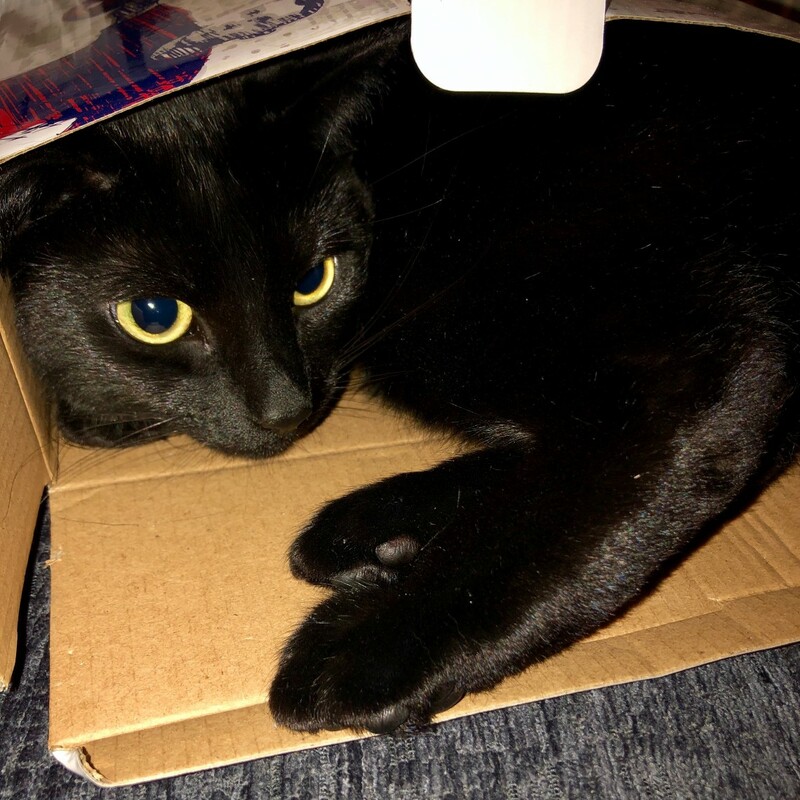 My son also cannot resist a box to sit in! I wish that we still had a bowling alley close to where we live, that bowling ball looks huge! Thanks for linking up with and for taking part in #MySundaySnapshot. Hi! These kids are very pretty. 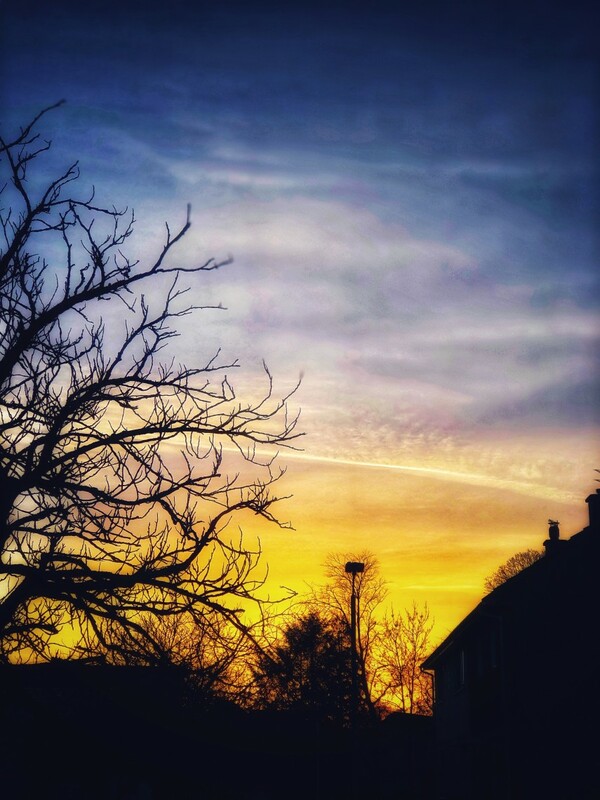 I like your sky’s photo very much. Thanks for sharing.